The Intercultural Outdoor Recreation Program brings people together from near and far through fun, accessible outdoor activities all year round. We invite new Canadians and all Montrealers to join us to try hiking, biking, canoeing, kayaking, camping, winter sports and more! The Intercultural Outdoor Recreation Program started in 2010 when Adrienne Blattel created it with the Milton Park Recreation Association, an inner-city community centre and non-profit organization in Montreal. Ever since an initial canoe-camping weekend in 2010, the program has grown in scope and size. Each year, around 500 people from dozens of different countries participate in approximately 75 outings. We strive to offer activities that are accessible to new Canadians even if they do not have a car, specialized outdoor gear, prior experience, or a big budget. We design outings that foster intercultural understanding, promote the integration of new Canadians, and make outdoor recreation more accessible in Montreal. Activities including hiking, biking, kayaking, canoeing, camping, cross-country skiing, snowshoeing, skating, nature appreciation and outdoor language exchanges. Adrienne Blattel just loves being outside! She’s originally from Ottawa, Ontario and has lived in Montreal since 2002. Adrienne grew up cross-country skiing with her dad in Gatineau Park and canoeing at summer camp. Her first summer jobs involved instructing whitewater kayaking and leading multi-day bicycle tours. Adrienne’s time abroad inspired her current work with new Canadians: as a member of a kayaking club in Mâcon, France, and a hiking club in Kotor, Montenegro, she experienced first-hand how outdoor recreation can bring people together across cultures. Adrienne has a Masters in Environmental Studies from York University. 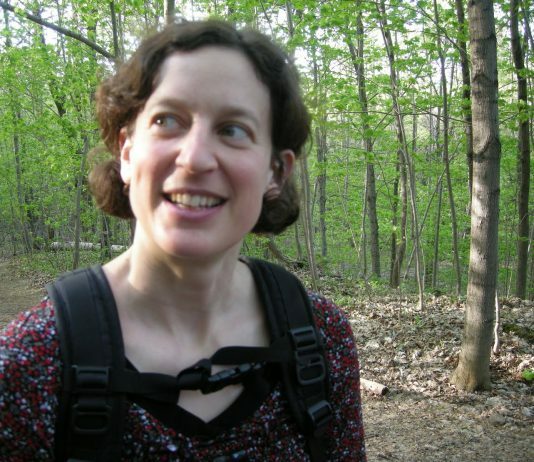 From 2002 until 2010, she worked as a community development program director with the Quebec-Labrador Foundation, while leading numerous kayaking outings with a local Montreal club on weekends. Adrienne founded the Intercultural Outdoor Recreation Program early in 2010 with the Milton Park Recreation Association. Adrienne is the staff member responsible for the program. In 2017, Adrienne won an outdoor entrepreneur award from Mountain Equipment Co-op. Hiking up Mount Royal countless times with program participants has allowed Adrienne to connect even more deeply with nature and has fostered a newfound passion for plants, trees and urban nature. So far, I have not found another program in which immigrants are welcome in such warm, welcoming and respectful way. The activity is super friendly! It promotes the people to be open and relaxed. Montreal is multi-culture city with very beautiful and long winters. Learning how to do winter activities and meet people from different countries are the best ways to integrate into life in Montreal. During this activity, we had fun together. Joy is the best motivation to repeat an activity. I didn’t know how to, where, and when to ski. In this activity I got all these. Winter is not a monster or obstacle for enjoying the life. Just need to know what lifestyle matches best. Thanks to this activity, we explore more about it. It was an opportunity to break out of isolation and participate in a social activity, creating a sense of self-worth. In terms of health and social company, the benefits are immense. The simple act of trudging in the deep snow with others is an ennobling, spiritual experience. I have gained a lot from conversations with people originally from Latin America and the Arab countries, among other places. In learning Spanish and Arab in Montreal, these interactions at the same time have helped me gain a wider and deeper knowledge of peoples and cultures in those regions of the world. My interest in learning more foreign languages is greatly enhanced by the opportunity to meet immigrants through these walks and to know about their past and present lives. Sharing of common problems as immigrants helps a lot in breaking isolation and in gaining confidence. Thanks, Adrienne, for an incredible hike yesterday! There’s something about your hikes, and outdoor activities in general, that are so re-energizing (probably because for once I’m not in coordinating mode, but leave that in your very capable hands! ), but also just the people you bring together… authentic, sincere, and genuine people, who seem sincerely interested in who you are as a person, not an employee. Always feel re-energized and able to tackle on the problems and challenges we all face; the health benefits, both psychological, physical, but most importantly, physiological and mental,of being out in nature (with friends) cannot be understated, and I really thank you for organized such fun outings. Guide to Montreal’s Outdoor Recreation Clubs – in Winter (Dec. 2018)!